A tyrannosaurus roared at me yesterday. He was chasing three princesses, though when they proved elusive he unleashed his rage at me. The whole ordeal would have been terrifying were it not for the dinosaur’s miniature size, overt disinterest in eating me, and fuzzy cotton hide. That dinosaur—and hundreds of other equally eager costumed children, their families in tow—circled Jamaica Pond last night in the 26th annual Lantern Parade. Bearing homemade lanterns constructed from halved soda bottles and decorated with colored tissue paper, they marched around the pond at sunset in a procession of bright, bobbing blazes, the pond mirroring the lights off dark, still water. The parade is an annual fall tradition put on by Spontaneous Celebrations, the Jamaica Plain non-profit that organizes community events in the neighborhood. 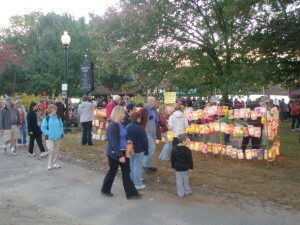 Profits from lanterns sold at the event—participants were welcome to either bring a personalized lantern from home, or choose from the hundreds designed by volunteers—went toward the organization’s budget. 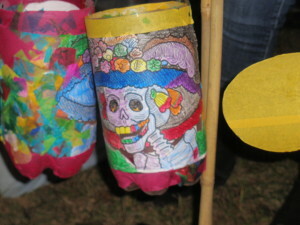 With influences from Japanese and Dutch traditions, the parade, “reflects [Spontaneous Celebrations’] dedication to building community by exploring old and creating new cultural traditions,” according to the organization’s website. Live jazz, played from the gazebo at the south end of the pond, provided a marching beat for the lantern-bearers. A few boats, lanterns dangling from the rigging, floated silently across the pond like ghost ships, their tillers manned by ghouls and firemen. The strength of community on display—while not atypical for Jamaica Plain—was astounding. A general atmosphere of camaraderie pervaded the night; families recognized and greeted everyone who passed, their perceptions not hoodwinked by others’ disguises. Taking place on the last Sunday of October every year, the parade is a fitting way to kick off Halloween week putting both the holiday’s commercial side (kitschy, store-bought costumes) and spooky side (eerily glowing embers flickering around a moonlit pond) on display for one serene, sparkling night.